The Stretch Glass Society is an avid group of Stretch Glass collectors. Our goals are to help preserve this beautiful glass and the history of its manufacture as part of our American heritage, to educate the public as to its existence, to promote an appreciation of collecting this type of glass -- and to have fun while doing all of the above! 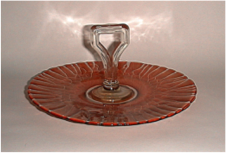 The National Depression Glass Association has released their April-May 2019 newsletter featuring part 1 of a two-part article written by SGS President Cal Hackeman about stretch glass patterns and optics. Similar to SGS, access to the full newsletter is restricted to current NDGA members. Part 2 of the article will appear in the next issue of the NDGA newsletter. All photos will be available here one week preceding the call. For a PDF of this announcement, click here. A Deluxe Edition Review of the discussion will also be available several weeks after the call. Many who have joined our discussions are thanking us for identifying their recent purchase. The last discussion in our 2018-2019 series will be on Opaque Stretch Glass by US Glass featuring their colors of Coral, Old Rose, Red Slag, Mandarine Yellow, Jade, Jade Green, Nile Green, Pearl Gray and Pearl Blue. Early Period Cut and Etched Stretch Glass was the topic of our Stretch Out call on Thursday, April 11, 2019 at 8 pm Eastern. We discussed the photos in this document on the call. A Deluxe Edition Review of the discussion will also be available several weeks after the call and will be posted here. Further information is available on our email: info@stretchglasssociety.org. Check out the Deluxe Edition Review of the November 8, 2018 discussion of Patterns in Stretch Glass. To view the document with photos discussed during the call, click here. Collectors interested in iridescent stretch glass who have joined our discussions are saying how very informative and educational they are. Stretch glass enthusiasts now have a new issue of The SGS Quarterly to explore for news, updates and informative articles on American Iridescent Stretch Glass. The March 2019 issue of The SGS Quarterly was mailed or emailed to all members and subscribers recently. Check out the featured pages here. Not a member of The Stretch Glass Society but interested in learning more about stretch glass and seeing what else is included in the March issue of The Quarterly? You can now join The Stretch Glass Society online and get access to this and all past issues of The Quarterly plus lots more information on stretch glass. Go here to sign up today. Late Period Fenton Stretch Produced for Others was the topic of our Stretch Out call on Thursday, February 7, 2019, at 8 pm Eastern. We discussed the photos in this document on the call. Fenton didn’t make a lot of stretch for entities other than QVC. They made some pieces as special orders for museums, gift shops, catalogue items for small glass houses, and collectible clubs. These items may appear on the secondary market. On this Stretch Out call we learned how to identify these items. Check out the Deluxe Edition Review of the October 11, 2018 discussion of Stretch Glass Candlesticks. Cal Hackeman, Stretch Glass Society President, was on the road from October 27, 2018 through November 5, 2018 on a mission of education and recruitment. Click here for a full report on Cal’s travels to represent SGS at the Northeast Ohio Glass & Pottery Show, the Great Lakes Carnival Glass Convention, and the Michigan Depression Glass Society Show. We are pleased to announce the 2018-19 Stretch-Out Discussion Series. Collectors interested in iridescent stretch glass who have joined our discussions are saying “Very informative and educational’, “Thanks for identifying my recent purchase” and “Wow! I didn’t know Fenton made that!” If you have never joined a call, try it! You can just be a listener or join in on the discussion as you enjoy the experts and other ’enthusiasts’. There are always beautiful photos of the items to be discussed. Who made which ones: What colors are known? Rare or common? Yes, there are many patterns in stretch glass; how many do you recognize? 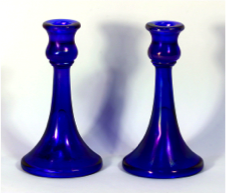 February 7, 2019 -- Late Period Fenton stretch glass produced for others. Will you recognize this stretch glass when you see it? April 11, 2019 - Decorated stretch glass. Did you know there is glue under much of the gold decoration? Learn how it is done and how to preserve it. May 9, 2019 - Opaque stretch glass by US Glass. Salmon, Florentine Yellow, Nile Green, Old Rose, Pearl Blue, Pearl Gray; what items are known? Join us to learn all about this beautiful glass, to ask questions and share your finds. The calls are at 8pm Eastern, 7 Central, 6 Mountain and 5 Pacific time. The call information is also posted on our website under Events / Stretch Glass Discussions. A Deluxe Edition Review of the discussion will also be available several weeks after the call. Approximately one week prior to the call, an email reminder and photos of the glass to be discussed will be sent to members who have given us their email address; the photos will also be posted on our website. If we don’t have your email address and you would like to receive the reminder and photos, please send your email to info@stretchglasssociety.org and ask to receive photos for the particular stretch out call. If you have questions about your stretch glass and would like information from our experts, please send a photo to info@stretchglasssociety.org with your questions and we will do our best to respond. For a PDF (printable) version of this schedule, click here. For additional information about participating in the discussions, please click here. Check out the Deluxe Edition Review of the May 10, 2018 discussion of Late Period Fenton Stretch Glass Made for QVC. To view the document with photos discussed during the call, click here. This was our fourth discussion on the topic of lesser-known companies that were producing stretch glass from 1916 to 1933. On May 10 we discussed the production from two of the ‘minor’ glass companies, Central Glass Works (Wheeling, Pennsylvania) and Jeannette Glass Company (Jeannette, Pennsylvania). Central appears to have used a single bowl mold, but shaped the mold into many forms. They also made two sizes of trumpet-shaped candle holders. Some of their pieces have gold glue-chip decoration. In contrast Jeannette used several bowl molds. They also made handled servers with unique handle shapes. Both companies used a multitude of different colors. 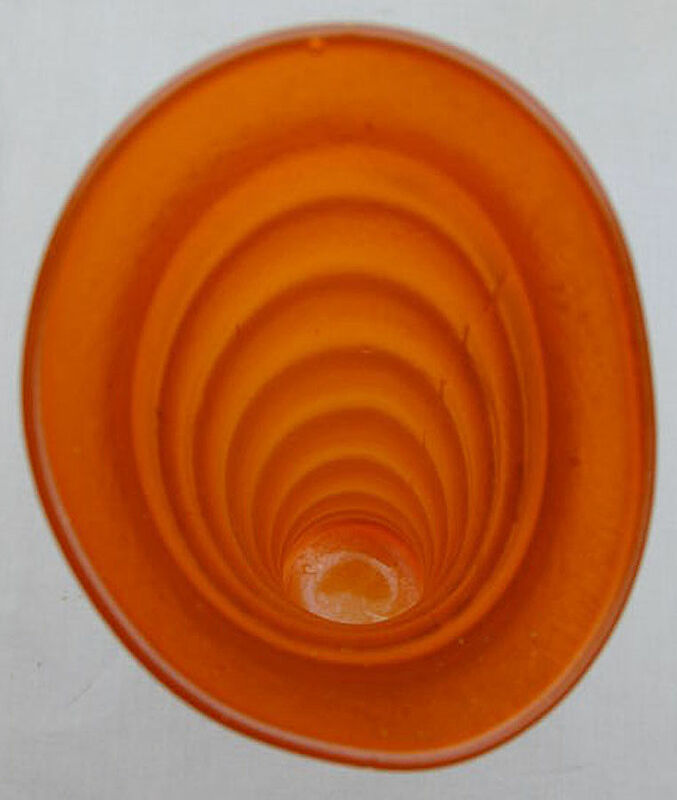 Recently a 15” tall Fenton Tangerine Ring Vase was listed for sale on eBay. 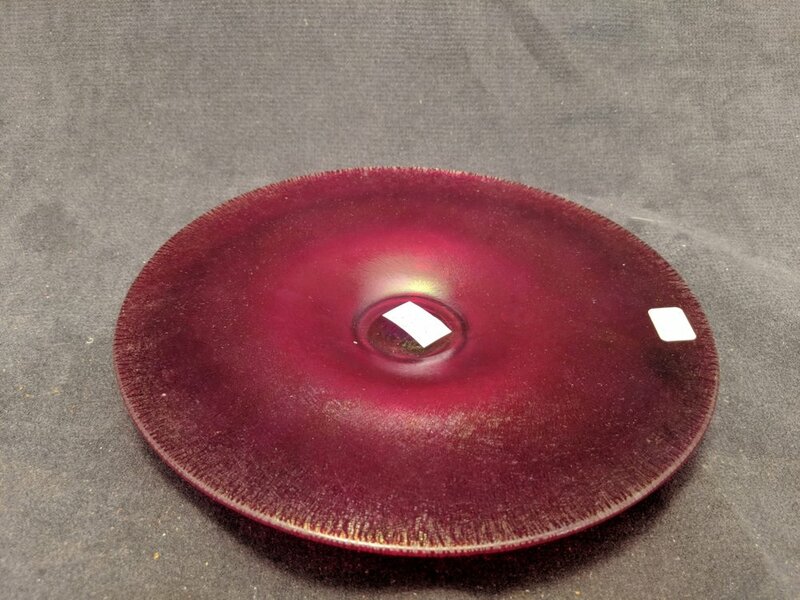 After bids hovered in the $300’s for most of the auction, in the final moments the price climbed to $845 achieving one of the highest prices paid for this particular example of stretch glass. The vase is taller than many ring vases and, according to the photos, has exceptional color. In 2013 a similar vase sold for $375, according to Doty’s Carnival Glass Price Guide. This sale continues to confirm a trend we have seen for several years of exceptional, hard-to-find and rare examples of stretch glass commanding increasing prices from serious buyers and collectors. We congratulate the new owner of this vase -- whoever they may be -- and hope they will display it at a future Stretch Glass Society Convention for all to enjoy. Click any of these photos to enlarge to full size. Is stretch glass available in the marketplace? I am often asked this, or some version of this, question especially by newer or would-be collectors of stretch glass as well as resellers of antique and collectible glass. The answer, as you will see from the galleries of photographs and full text of this report on the page linked below, is a resounding YES! Over the past 12 months, I made a concerted effort to take photos of stretch glass I saw being offered for sale in antique shops & malls, auctions, flea markets, antique shows, etc. where I was present. My travels during this time have covered much of the northeast plus various areas of New York, Pennsylvania, Delaware, Maryland, Virginia, West Virginia, Ohio and the Carolinas. Full the full report and galleries, click here. The pricing database recently released by Hooked on Carnival is the model for the Stretch Glass pricing database which is being developed by Kathi and Galen Johnson in conjunction with several leading collectors of stretch glass. The Hooked on Carnival pricing database includes a number of stretch glass items, particularly those with patterns in which there is a shared interest by carnival and stretch glass collectors. We encourage you to take a look at the recently released pricing database and provide us with your comments, suggestions and experiences at info@stretchglasssociety.org. Your input will be considered as we develop the stretch glass pricing database during 2018 and early 2019. Click for: Hooked on Carnival press release. Dave Shetlar recently provided additional photos and comments on the Handled Servers display at our 2018 convention. The Stretch Glass Society has the tradition of assembling a club display that concentrates on a color (we did green last year), a maker, or specific items. This year, Dave was in charge of assembling all the handled servers in stretch that we could find. Initially he predicted we would have over 50 servers but we ended up with 120 different servers!! It was quite an assemblage. In this feature, previously published on Stretch Tuesday by Hooked on Carnival’s Fred Stone’s Carnival Mailing List, Dave discusses a number of the more uncommon handled servers in the 2018 club display. For Dave's full report and complete set of photos, click here. See also the full 2018 Convention recap intro below. The Stretch Glass Society 2018 Convention was another successful annual event. Click here for a summary page with links to daily reports and complete galleries. SGS member Wally McDaniel was busy promoting stretch glass and the SGS at the recently concluded International Carnival Glass Association (ICGA) convention. His display featured a colorful variety of Imperial stretch glass. 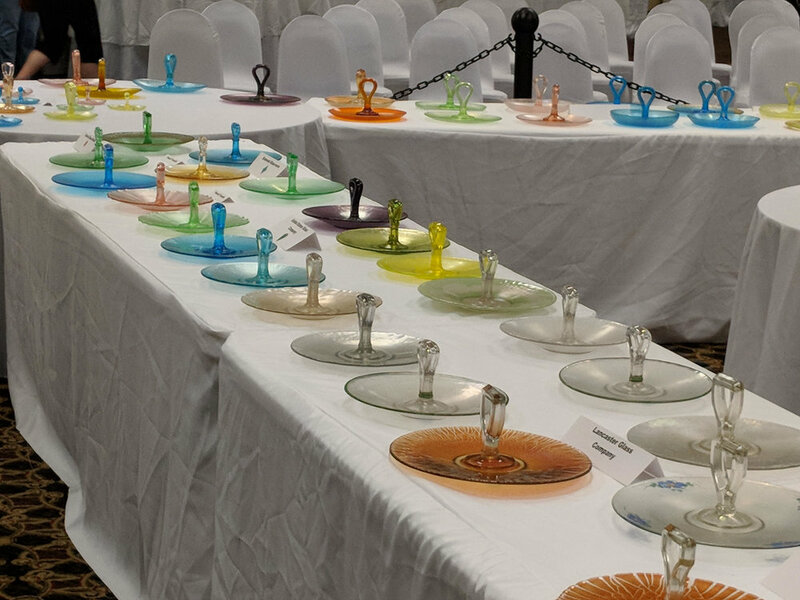 The display was popular with those attending the convention, many of whom also include Imperial stretch glass in their carnival glass collections. We thank Wally for contributing to our on-going efforts to show and promote stretch glass and congratulate him on his beautiful display. Click on the photo to enlarge to full size. 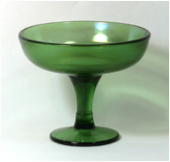 How are Stretch Glass and Depression Glass related? SGS President Cal Hackeman's essay "Stretch Glass -- The Older Sibling," describing how stretch glass is related to depression glass, was published in the June-July 2018 issue of the National Depression Glass Association (NDGA) newsletter News & Views. We would like to thank the NDGA for allowing us to repost the article on our website. The Stretch Glass Society Board of Directors has established the Bill Crowl Memorial Education Fund. A generous initial donation will allow us to begin to immediately utilize the fund to provide educational activities related to stretch glass. The Fund also reminds collectors and future stretch glass enthusiasts of the many contributions Bill made to the rise of stretch glass as a recognized and appreciated category of antique and collectible glassware. Bill was among the Founders and Charter Members of The Stretch Glass Society, a life-long and a Life Member of the Society. The Fund will be managed by the Stretch Glass Society, a tax-exempt public educational charity under IRC Sec. 501(c)(3). For full information or to donate online, click here. If you shop on Amazon.com, you could be supporting The Stretch Glass Society every time you shop by signing up for Amazon’s Smile program. How does it work? Amazon.com offers all of its customers the opportunity to select their favorite charity for a donation from Amazon Smile from every purchase they make. There is no cost to you, the shopper, and shopping through Amazon Smile is exactly the same as shopping on Amazon.com – except your favorite charity benefits. What do you need to do? The next time you are shopping on Amazon.com, click on Amazon Smile and enter the Stretch Glass Society as your favorite charity – we are already in Amazon’s database of charities. From that point on, sign on to Amazon Smile to do your shopping. For every purchase you make, Amazon Smile will contribute .5% of the purchase price to The Stretch Glass Society. Several members of The Stretch Glass Society have already signed up and we have already started receiving payments from AmazonSmile. Once you sign up, you can also ask your friends and business colleagues to select The Stretch Glass Society as their favorite charity and increase your support for us.